I have 3 KinectV1. Calibration 2 KinectV1 with board works great, perfect quality, but for 3 KinectV1 it is unavailable (only calibration with light marker). Calibration 3 KinectV1 with Maglite's flashlight (or PS Move) - the quality is very bad, I have 5-6 times to redo the calibration for medium-good quality. Do you plan function of calibration >2 depth sensors with board? Or can three sensors calibrated in pairs with board, and then somehow merge the data in a scene file with 3 sensors? As I understand it, in the XML scene file I can change parameters of each sensor manually. We do not plan to extend board method for larger numbers of depth sensors. Actually, in our tests flashlight method has better accuracy when done properly. Maybe you have problems with light marker detection in your videos due to bright lighting or occlusion. If you share some of your bad calibration videos, I could probably provide you specific recommendations on improving the calibration technique. I think that the main problem is that I can't change settings on my Kinect (in the "Properties" tab). 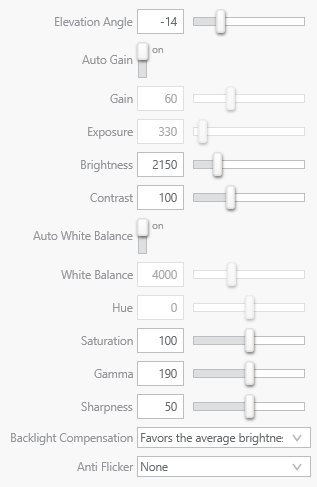 I can't turn off the "Auto White Balance" (which spoils the video quality), because all the buttons do not work (except "Elevation angle"). I don't know why. I just press a button, but it don't seem pressed. I have this problem in iPi Recorder 2 and iPi Recorder 3. Reinstalling drivers for Kinect did not change anything. Can you please have any advice? If you've got Kinect for XBOX 360 - it does not allow to set any props besides elevation angle. Only Kinect for Windows does. Do you have any errors in iPi Recorder log after trying to change values of Kinect props? To view the log press button at the top-right of the program window. Could you provide screenshots with Properties panel and calibration problems? To improve marker recognition, try to dim lighting during recording and choose different settings for marker size before running calibration in Mocap Studio. Light problems are simple - in completely dark room this Kinect see nothing (even marker), but other Kinects see marker. In not completely dark room this Kinect see light room, but other Kinects see dark room. So I need to record calibration in a bright room, but it spoils the quality of calibration. Also, when I put on camera sunglasses (just for test) - video first become dark and then become bright again. Unfortunately, I deleted the videos, but this Kinect exactly have the problem with the automatic white balance (especially in dark room). Do you think that the problem might be in the device? Definitely there is something with this specific device. We distinguish between Windows and XBOX devices by their vendor and product IDs reported to the OS. For some reason, this sensor reports the same VID&PID as Kinect for Windows. Maybe, it has updated firmware version, which does not support controlling color camera settings though. Well, I will try to do anything with the firmware (or something like that). On the other hand, 25-30$ for a "new" Kinect - not too expensive for me, and medium quality calibration - also gives the normal quality for some movements. What I usually do is record in the evening when I have better control over room lighting. Turning off all lights except for one overhead seems to work best, and I've even considered putting that light on a dimmer for recording calibration video. I don't know if that will help you but you might give it a try. Thanks, Greenlaw, for the advice! These methods gave me at least some result before. However, I have replaced the problematic sensor on the other (exchanged with my neighbor), and the problems become much less. ;) Still, it was more a technical problem with only that Kinect than with software.